Aches and pains are signs your body isn't working right. Your brain, spinal cord and nerves control how your body works. Physical, chemical, or emotional stress can overload your nervous system. Muscles tighten, spinal joints lock, and nearby nerves are irritated or impinged. This puts stress on the nerve. With or without symptoms, the resulting nerve stress impairs the way our body moves and functions. A thorough examination locates the source of nerve compromise. Applying a precise gentle force to spinal joints helps the body right itself. Well-being can return as repeated visits restore nervous system integrity. Today's chiropractic has helped millions, regardless of condition. Where conventional or "allopathic" medicine focuses on treating illness through surgery and pharmaceuticals, the goal of chiropractic is to optimize health with a non-invasive approach that does not use drugs or surgery. Chiropractic's primary avenue of care is manipulation of the spine and the framework of the body. Chiropractors are also licensed to use physical therapy and nutritional interventions to aid the patient in restoring their health. 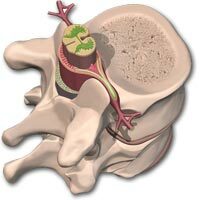 The spine is an important structure that houses and provides protection for the spinal cord, while providing mobility for the upper body. This dual requirement of strength and flexibility makes the spine a very complex structure, with multiple joints at each spinal segment (the vertebrae) forming the spinal column. When these joints (also known as articulations) are not positioned or functioning normally, it can affect the nerves exiting the spine. Chiropractic care attends to irritations along the spine by manually repositioning these joints. This is a chiropractic "adjustment." The word "chiropractic" comes from the Greek words cheir (hand) and praxis (action), and simply means "done by hand." Note that the word "chiropractic," while a bit awkward, is the actual name of the profession. A chiropractor practices chiropractic medicine (not chiropracty or chiropractics). Chiropractors are licensed professionals who are trained to diagnose and appropriately care for or refer patients for the care they require. Accordingly, they continually assess their patients from dual perspectives, asking: What might I do for you, as well as, what might you also need today beyond my abilities? Chiropractic patients often visit their chiropractor periodically in order simply to relieve irritations - to get "adjusted." Individuals also seek chiropractic care for back pain, headaches, joint pain, carpal tunnel syndrome, tendonitis, sprains, as well as non-musculoskeletal conditions including allergies, asthma, and digestive disorders. Some chiropractors further specialize in orthopedics, sports injuries, neurology, pediatrics, nutrition, internal disorders, or diagnostic imaging. Due to its focused hands-on attention to the spine, the profession is often thought of by its tools and by its avenue of care. Chiropractic, however, is not just about manual care of the spine, although it has certainly built a reputation caring for that often troublesome piece of anatomy. In chiropractic, care of the spine and nervous system (which is of fundamental importance in human health) is the way to optimize the health of the whole human system and not just a means to relieve back complaints. A basic philosophy of chiropractic is that the body naturally seeks the proper balance among all the systems of the body, and that these systems are meant to work together. A second basic principle is that proper structure is necessary for proper function. If a structure is impaired by injury or stress, its function can be adversely affected. For example, when our spine (structure) is not positioned normally, it can irritate the nerves exiting the spine. And when spinal nerves are irritated, they don't function normally and can affect the function of the tissues they interact with. This "end-organ" effect is the central interest in chiropractic care. This "end-organ" can be an organ system (such as the GI tract), a muscle, or the overlying skin area. The relief of localized discomfort at the point of irritation is also an objective of care. Thus chiropractic focuses on the integrity of the spine and its surrounding tissues as a means to enhance normal human function and health.